For over 45 years, Do-It Corporation has been designing and producing hang tabs. Major product producers all over the world trust Do-It hang tabs to securely display their retail products. 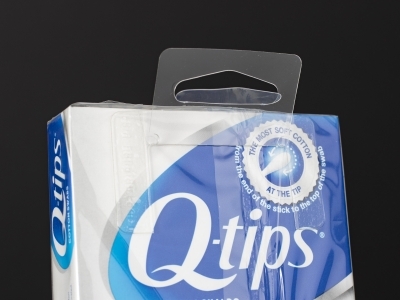 Unilever uses an R-51 Fold-Up Hang Tab for the Q-tips 170-count box of cotton swabs. The R-51 provides display flexibility. With the hang tab folded down, the product can be displayed on a shelf or in a bin. Folded up, the shrink wrapped box can be hung on a peg hook or display strip. The clear hang tab is placed on the back side of the box and does not block any product information. With the hang tabs folded down during shipment, Unilever can continue to use their existing master carton boxes.